Over the past three weeks we have sampled buds of grape, stone and pome fruit to determine the extent of 2016 winter injury. 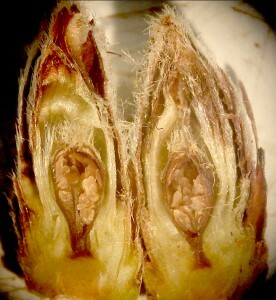 Cut cane and tree fruit branches were either placed into a cold temperature chamber for freeze temperature assessments, pushed indoors to determine flower development and or buds removed from field cuttings, sliced and placed under a dissecting scope to view flowering parts. To date we have found losses of Cab Franc grape, peach, plum and apple. 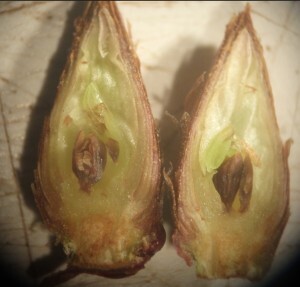 It appears the majority of bud damage occurred from a single freeze event that occurred on February 13-14th. The winter low temperature in Highland, NY was -10.6F, recorded at the experimental vineyard and orchard at the Hudson Valley Research Laboratory hill top (considered a good grape and stone fruit site) on February 14th, 2016. From bud freeze assessments we’ve observed 10-40% loss in Cab Franc, low levels of damage in Riesling given our predicted modeling based of the lowest temperature. 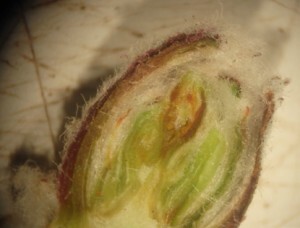 In the tree fruit survey high losses were observed in peach, injury to plum depended on variety and site with low levels of flower bud injury observed in apple, found in Table 1. On March 14th we began to see flower buds push to the popcorn and pink stage. To date the percentages are very low, estimated at one per 5 shoots of the varieties we’ve selected that include Harcrest and Red Haven.